The exciting posedown was won by BASIL FRANCIS from Jerry Scalesse and Simon Lancaster. The second part presents the posing routines of all 15 Pro competitors through to the posedown and award to Pro winner OLEV ANNUS of Finland. 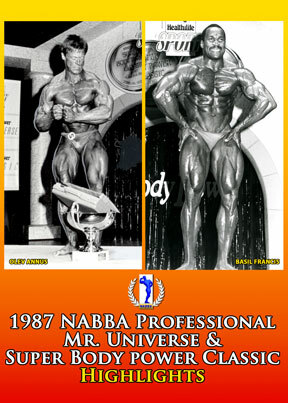 The 1987 NABBA Amateur Super Body Power Classic was held in conjunction with the NABBA Professional Mr. Universe contest in Harrogate, Yorkshire, England. The date was 26th September, 2 weeks after the NABBA Amateur Mr Universe in London. 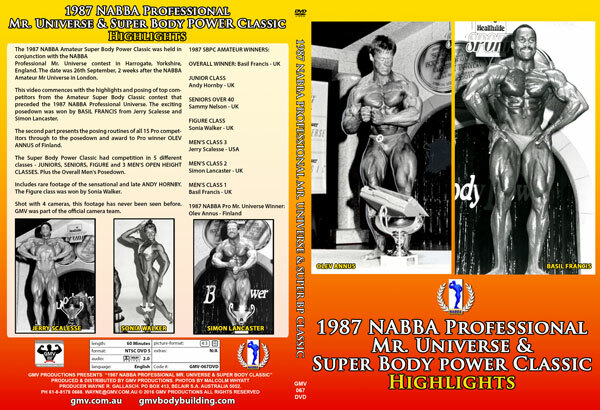 This video commences with the highlights and posing of top competitors from the Amateur Super Body Classic contest that preceded the 1987 NABBA Professional Universe. The exciting posedown was won by BASIL FRANCISfrom Jerry Scalesse and Simon Lancaster. The second part presents the posing routines of all 15 Pro competitors through to the posedown and award to Pro winner OLEV ANNUS of Finland. The Super Body Power Classic had competition in 5 different classes – JUNIORS, SENIORS, FIGURE and 3 MEN’S OPEN HEIGHT CLASSES, Plus the Overall Men’s Posedown. Includes rare footage of the sensational Junior Winner, the late ANDY HORNBY. Sammy Nelson won the Over 40s Class. The Figure Class was won by Sonia Walker. Shot with 4 cameras, this Super Body Power Classic footage has never been seen before. Photos by Malcolm Whyatt. GMV was part of the official camera team.